ome see Maine Gun Safety's Board Chair Bill Harwood discuss the 2nd Amendment at TEDxDirigo, Saturday November 3, at the University of New England! Maine Educators United Against Gun Violence organized a symbolic teacher walkout on March 15, 2018. Educators left their Portland schools at 3:30 pm and marched towards a rally at Portland City Hall featuring students, teachers, Gubernatorial Candidate Mark Eves, and Portland Police Chief & MGSC Board Member Mike Sauschuck. Maine educators have had #enough and are staging a symbolic walkout to show that educators are united in their commitment to end the cycle of senseless gun deaths in our country. how to find the derivative of a logarithmic function. and the causes of global warming. the students learned the physics of how fast a bullet travels. where the winner was the one who didn’t get shot. as bullets danced down the hallways. and how to barricade classroom doors. because a broken leg is better than a gunshot. and how to attend 17 funerals in week. it is all for the sake of the children. but when we are dying at our desks, they do not care. it’s a godforsaken american right. it’s a reason to get shot. every woodchip on every playground is soaked in blood. just in case today i’m the one who doesn’t come home. Atia Werah, Waynflete Class of 2018, gave a brilliant and powerful speech! Portland Schools Superintendent Xavier Botana - Read his excellent article in the Forecaster - it even mentions the walkout & MGSC. For more information about Maine Educators United Against Gun Violence, please email contact@mainegunsafety.org and we will forward it to the teacher leaders. "At Cape Elizabeth High, the event will include an appearance by Maine Gun Safety Coalition executive director Nick Wilson... 'They, the students, are keeping this story (the Parkland shooting) alive, and I think we’re all surprised by how involved they are,' Wilson said. 'As a movement and as a generation, we’ve failed these young people by not closing the loopholes in gun laws. Now we need to support them and get out of their way.'" “You know it's our lives that are being impacted by it and a lot of the people in power have never felt the type of fear students who are going to school today have to fear and so it's important that we get that message out,” Sage Waterson, Senior at Yarmouth High School. “I don’t want to go to school worried for my safety because politicians value the right of a gun over my right to live,” said 14-year-old Marcello Santomenna. The annual Fitzgerald award dinner recognizes public figures who help advance our mission of improving gun laws in Maine. Past honorees include Congresswoman Chellie Pingree, US Senator Susan Collins, Sherriff and Sen. Mark Dion, and Assistant U.S. Attorney Margaret Groban. The award is named for the late Buzz Fitzgerald, who co­founded the Maine Gun Safety Coalition with Congresswoman Chellie Pingree and attorney William Harwood following the Columbine High School Massacre in 1999. The Fitzgerald dinner supports our legislative initiatives, education programs, and the Free Trigger Locks program. 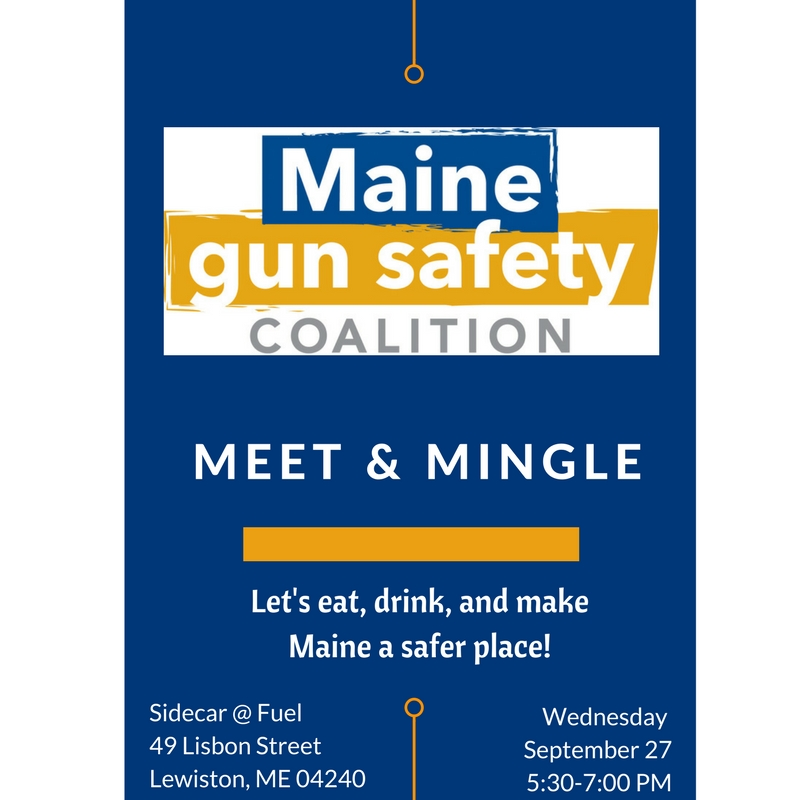 Join Maine Gun Safety Coalition for food, drinks, and fun at our Bangor Fall Mixer! Thank you to our Host Committee! More info & RSVP here! Preventing Gun Violence will be the topic of a free public forum, from 7:00 to 8:30 p.m., on Thursday, October 12, at First Congregational Church, 55 Elm St., in Camden. The church’s Faith and Public Issues Task Force is sponsoring the event. The two speakers scheduled are Senator Dave Miramant, who represents Maine District 12, and Nick Wilson, Executive Director of the Maine gun Safety Coalition. Roy Hitchings will be the moderator for the forum, which will be in the Pilgrim Room, a meeting space entered from the church parking lot. More info here. Maine Gun Safety Coalition is thrilled to announce that we will be hosting a lunch with Avery Gardiner, the new co-President of the Brady Center to Prevent Gun Violence! Learn about Brady's recent legal successes, including holding gun manufacturers and sellers accountable in the courts and protecting the right for doctors to discuss safe gun storage with patients. Ms. Gardiner will also address topics such as the Supreme Court, expanding Brady background checks, and changing culture. Bring your questions for a lively discussion about the past, present, and future of Second Amendment litigation.